After almost Three weeks without fishing due to both a bad chest infection for myself then Two weekends of snow, ice and a frozen boat dyke, we finally managed to get out once more. 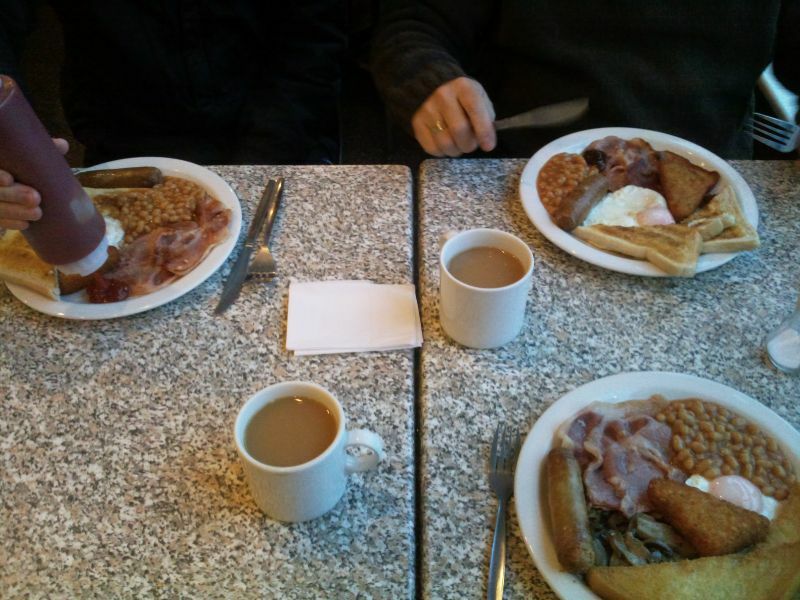 Myself, Neil and Dean decide to have some Nosebag (Breakfast) before fishing today so we don't need to cook food during the day. Three full English and teas are ordered and devoured in no time at all. The boat dyke has finally thawed after the cold snap and already the resident Pike are chasing their breakfasts all over the dyke. We could probably have a decent days fishing in here, but the size of fish tends to be much smaller. We are loaded and on our way by about 8am, giving me half an hour to sort out the tackle on our way. Today we have chosen to fish the "match length" at Riverside road. 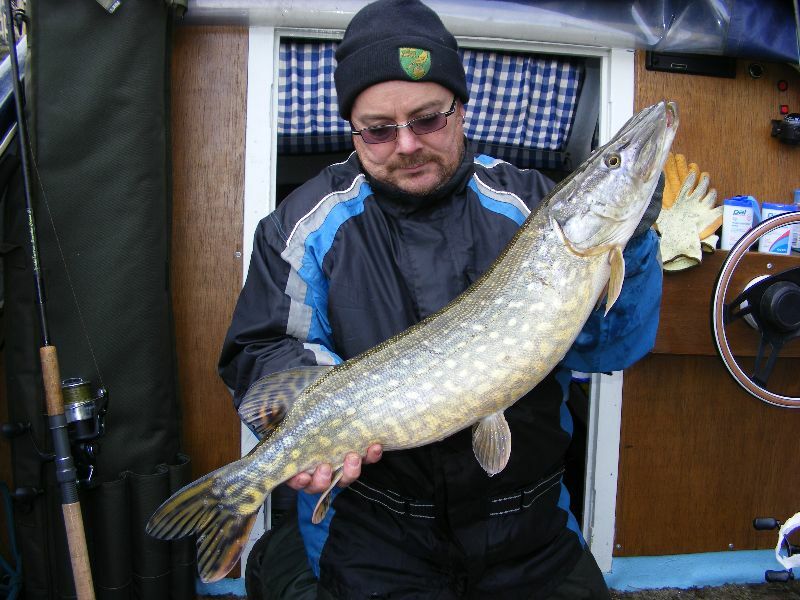 There is always plenty of bait fish in this section and so we are hoping the Pike may be making up for the last Two weeks bad weather and gorging themselves on the resident Roach shoals. Its 9am when we cast our first baits in and we are not even completely organised when Neils float ledgered Bluey is picked up. A decent fight turns up a nice fish of 10lb 4oz, a good start. 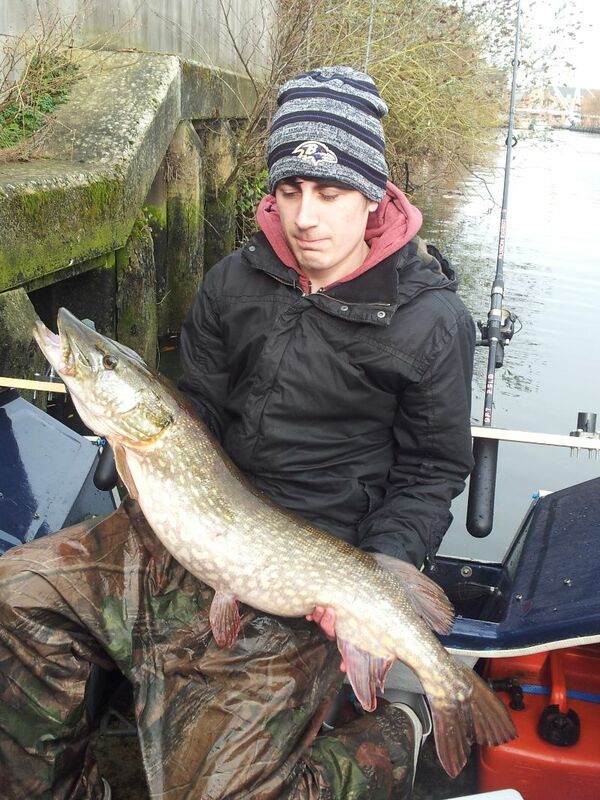 Dean is next to get some interest, again its a float ledgered Bluey this one fished tight to the bank behind the boat. This fish also puts up a lively scrap and even tries a mini tail walk. 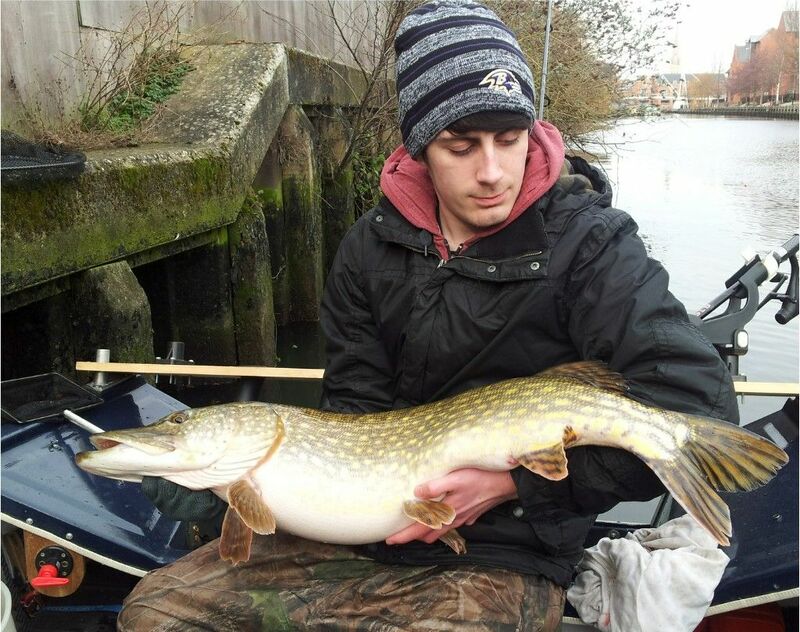 This fish goes 13lb11oz and becomes Deans new PB. We carry on trying various baits and switching between float ledgered deads and paternostered lives and eventually Neil picks up another fish, a jack of about 5lbs. What happens next can only be described as "mindless". A yacht is making its way downstream under power from a small but noisy outboard, fairly close to the far bank, well away from us and no danger to our lines. When for no reason at all almost in front of us, it turns towards our bank. I grab the rod that is nearest to the boat but its already over the line and we are hooked up. A second rod is also caught and both reels clutches are now singing. Despite shouting to the bloke on board the boat carries on and shows no sign of stopping or even slowing down. We have no option but to hold the spools and pull for a break. Both reels are loaded with 50lb braid so unbelievably we do actually start to slow the boat down but as the lines are pulled tighter they obviously reach the prop and both line are cut off just below the float stops. Im absolutely fuming but can do nothing apart from set up the rods again. It is a lesson learnt though, in future the rods will be coming in as soon as any boat gets anywhere near to passing us. I later find out , the guy on this boat has a habit of doing this to fisherman so be warned if a small light coloured,noisy yacht approaches.. reel in ! Back to the fishing and as we have spare rods set up, we are soon fishing again. Its around half Eleven by now and the baits have only been back in for Ten minutes when Deans Live Perch/ Float rig disappears and the line is peeling off. He tightens up and almost straight away the fish feels bigger than he is used to. Slowly but surely with the fish staying deep, its near the side of the boat. The fish then tears off and the clutch is singing again, this time for the right reason. Again he carefully brings it closer and its soon on top, mouth flaring shaking its head. I net the fish first time and we prepare to lift it in. I already know its a new PB for Dean, his second of the day. Once the hooks are out, she is in the sling and goes 17lb 4oz. A lovely looking fish with a real belly starting to show. After a few quick photos we put the fish back into the sling to lift over the side. Im just explaining to Dean how we then lower it in, get the fish upright and let her recover, when with one flick of its tail its launching itself out of the sling like a torpedo back into the river... I thinks its recovered. boat. We have hardly moved anything when Neil is into a fish. A 6lb Jack is unhooked in the water. No sooner my rod is back in, that too is snapped up, this time a lively 8lb fish. This too is unhooked in the water and we can pack up. Blank avoided !! !